Wort brew machines OPPIDUM are the main components of the professional industrial breweries BREWORX OPPIDUM. The compact machine for preparation of wort includes six special vessels to maximize of production capacity. Thanks to parallel production method this machine is able to produce from one to six batches of wort per day. The wort brew machine OPPIDUM 1000 is a powerful professional compact equipment with industrial design which includes all necessary equipment to produce 1180 liters of wort in one batch from malt (or malt extract or wort concentrate), hops and water. The compact machine for preparation of wort includes six special vessels to maximize of production capacity. Thanks to parallel production method this machine is able to produce from one to six batches of wort per day – (from 1180 up to 7080 liters of wort per day). The wort production machine is the main functional component of the brewery BREWORX OPPIDUM 1000 . It is a food machine whose primary function is the production of wort. The wort is an intermediate product which is result of a first phase during production beer. The next phase of the production cycle is fermentation and maturation of this wort in fermentation tanks. The resulting product of this production process is a tasty refreshing low-alcoholic beverage – beer. 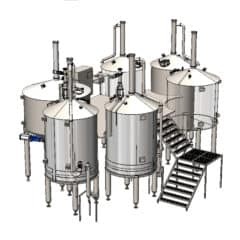 The wort brew machine OPPIDUM 2000 is a powerful professional compact equipment with industrial design which includes all necessary equipment to produce 2360 liters of wort in one batch from malt (or malt extract or wort concentrate), hops and water. The compact machine for preparation of wort includes six special vessels to maximize of production capacity. Thanks to parallel production method this machine is able to produce from one to six batches of wort per day – (from 2360 up to 14160 liters of wort per day). The wort production machine is the main functional component of the brewery BREWORX OPPIDUM 2000 . It is a food machine whose primary function is the production of wort. The wort is an intermediate product which is result of a first phase during production beer. The next phase of the production cycle is fermentation and maturation of this wort in fermentation tanks. The resulting product of this production process is a tasty refreshing low-alcoholic beverage – beer. 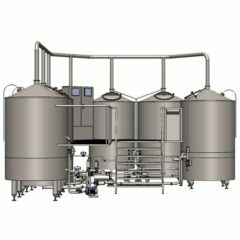 The wort brew machine OPPIDUM 3000 is a powerful professional compact equipment with industrial design which includes all necessary equipment to produce 3450 liters of wort in one batch from malt (or malt extract or wort concentrate), hops and water. The compact machine for preparation of wort includes six special vessels to maximize of production capacity. Thanks to parallel production method this machine is able to produce from one to six batches of wort per day – (from 3540 up to 21240 liters of wort per day). 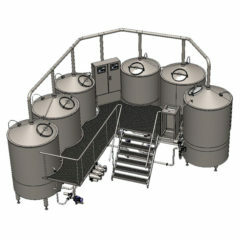 The wort production machine is the main functional component of the brewery BREWORX OPPIDUM 3000 . It is a food machine whose primary function is the production of wort. The wort is an intermediate product which is result of a first phase during production beer. The next phase of the production cycle is fermentation and maturation of this wort in fermentation tanks. The resulting product of this production process is a tasty refreshing low-alcoholic beverage – beer. The powerful singleblock brewhouse BREWORX OPPIDUM 4000 is a powerful professional compact equipment with industrial design which includes all necessary equipment to produce 4720 liters of wort in one batch from malt (or malt extract or wort concentrate), hops and water. The compact machine for preparation The wort brew machine OPPIDUM 4000 is a powerful professional compact equipment with industrial design which includes all necessary equipment to produce 4720 liters of wort in one batch from malt (or malt extract or wort concentrate), hops and water. The compact machine for preparation of wort includes six special vessels to maximize of production capacity. Thanks to parallel production method this machine is able to produce from one to six batches of wort per day – (from 4720 up to 28320 liters of wort per day). 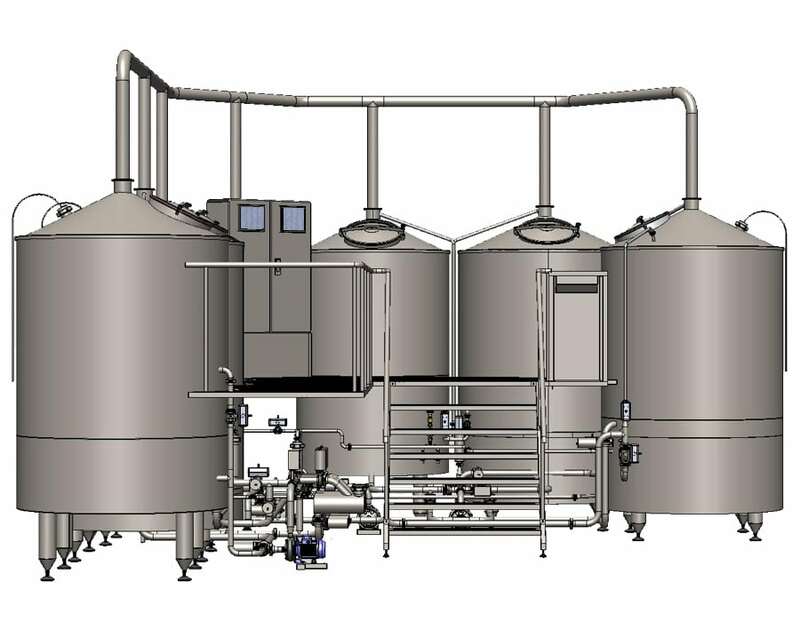 The wort production machine is the main functional component of the brewery BREWORX OPPIDUM 4000 . It is a food machine whose primary function is the production of wort. The wort is an intermediate product which is result of a first phase during production beer. The next phase of the production cycle is fermentation and maturation of this wort in fermentation tanks. The resulting product of this production process is a tasty refreshing low-alcoholic beverage – beer. The wort brew machine OPPIDUM 5000 is a powerful professional compact equipment with industrial design which includes all necessary equipment to produce 5900 liters of wort in one batch from malt (or malt extract or wort concentrate), hops and water. The compact machine for preparation of wort includes six special vessels to maximize of production capacity. Thanks to parallel production method this machine is able to produce from one to six batches of wort per day – (from 5900 up to 35400 liters of wort per day). The wort production machine is the main functional component of the brewery BREWORX OPPIDUM 5000 . It is a food machine whose primary function is the production of wort. The wort is an intermediate product which is result of a first phase during production beer. The next phase of the production cycle is fermentation and maturation of this wort in fermentation tanks. The resulting product of this production process is a tasty refreshing low-alcoholic beverage – beer.